In northern India, Freedom Fund partner Aangan seeks to ensure that the most vulnerable children are safe, supported, in school and assured a life free from exploitation. Aangan is working with marginalised families, increasing community awareness of trafficking, child marriage and risky migration, by establishing and training community freedom groups, child safety networks and child protection workers. Across Aangan’s working areas, group members are successfully using community-level data to facilitate a dialogue with government authorities, such as police and school officials, to jointly plan specific action on issues of child safety and exploitation. The community-level data initiative originated from a program exercise of drawing community safety maps, which are visual representations of risk and harm in different situations and times of day. Through this initiative, the organisation found data to be a powerful way to start dialogues with authorities about risk and to stimulate responses for preventing such risk. Using the safety map as a tool, young members of the community groups shared this information with authorities to jointly find solutions. For instance, in Varanasi, girls have to cross an abandoned field to go to the toilet and, on the way, they were being harassed by groups of men playing cards and drinking. Because the field is also on the route to school, some parents were unwilling to send their daughters to school because they believed it was too dangerous. Since the majority of the adult group members are daily wage workers and were not able to accompany their children to school, this meant girls were being forced to stay home, isolated and cut off from their peers, their education and their hopes for a better future. 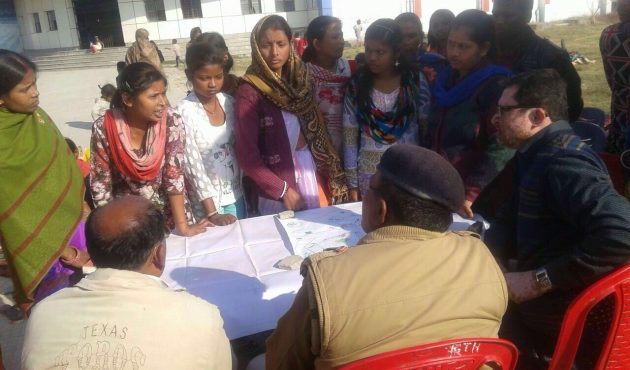 Similarly, in Gaya, girls identified locations where they were being harassed on their walk to school and shared their safety map at a joint meeting attended by the police. In response, police have increased patrolling and surveillance in the areas identified as risky. Because they have information about the times of day when girls are walking to and from school, they are able to respond by changing patrol times, making the girls feel safer. Community-level data is crucial for increasing officials’ accountability and in communicating a particular need because the data pinpoints and directs specific attention to the problem and facilitates a process of planning community level joint actions. Whether it is risky or unsafe locations, families migrating seasonally for work, or children out-of-school, when this data is presented to authorities, it provides the information needed to plan and execute effective safety strategies.